So the Des Moines Music Coalition's free "Music University: Managing the Media" was last night at House of Bricks. I talked on a panel with Joe Lawler (Des Moines Register, Juice) and Michael Swanger (CityView) about ways the 25-30 or so people in the crowd could get media coverage for their music. Sort of like a CMJ or SXSW panel except on a Wednesday night in the middle of Iowa, I guess. First of all, it was totally great to meet Joe and Michael, whose work I've been reading and enjoying ever since getting to this town back in July. I suspect their advice to the musicians in the audience was probably more immediately useful than mine, if only because they write professionally about music events happening locally and I don't. My main theme, maybe kind of a brutal one, but brutally honest: The surest way to get attention from journalists is to have fans. If you're making emotional connections with people, I'm going to end up hearing about you, and I may want to write about you-- and I won't ever feel like, "Oh, maybe I'll do something nice for this band and write about them." I'll feel like I really HAVE to listen to you-- and, better yet, if your music connects with me, too, I'll feel like YOU'RE the one doing something nice for ME. So many of the e-mails I get are from new bands nobody has heard of yet hoping to get a little Internet buzz going, and I do love discovering somebody before everyone else does, but your best bet is to play live a lot, send your songs to a bunch of smaller blogs, build a fanbase. That way, it won't even matter whether or not the critics like you. John Mayer will be making the music he wants for the rest of his life, and he may never get a single Pitchfork album review. ...Anyway, that's my rant. Thanks so much to Jill Haverkamp and the DMMC for including me in this event. It was an honor, and I'm really excited Des Moines has an organization like that in the first place. 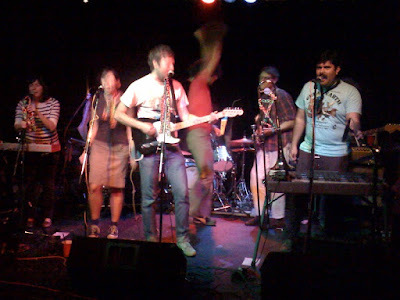 Also last night was a show by loosely San Francisco-based collective Still Flyin' at the Vaudeville Mews. I hadn't heard them, but the Poison Control Center's Patrick Tape Fleming had told me they included members of Masters of Hemisphere, Aislers Set, and Ladybug Transistor, so I was definitely in. When we got to the venue, Patrick talked to the band and told me they had a member of one of my personal favorite groups, recently defunct Australian indie-poppers the Lucksmiths, playing with them. I was dubious. "There are only three members of the Lucksmiths," I declared-- shamefully forgetting they became a quartet with the addition of guitarist Louis Richter (Midstate Orange) on their last few albums-- "and they're in Australia. There's no way one of the ACTUAL Lucksmiths is here." To which Patrick said something like, "No, man, he's right over there, let me introduce you to him." After I embarrassingly attempted to say hello to a couple of the wrong people (remember, I was still thinking this WASN'T a recognizable member of the Lucksmiths), Patrick finally pointed me in the right direction, and sure enough, there was Mark Monnone-- founding Lucksmiths bass player and current solo artist as Monnone Alone-- standing right there by the bar. To make the "small world" thing even weirder, I found out that this guy Gary back in my old neighborhood of Ditmas Park, Brooklyn, at whose house I had seen-- bear with me-- Swedish pop crooner Jens Lekman (who now lives in Australia) play a special post-concert set for fans, is a sometime member of Still Flyin'. Mark had been to that house, too. Gary wasn't there last night, though. The crowd was small, but Still Flyin' still managed to put on a fun, energetic set. There were nine people onstage, and I didn't get a good look at how many different instruments they were playing, but I do remember they had one dude who was basically a full-time hypeman/dancer. I also remember Gabe-- the one with the mustache, the 'stache that puts my still-tentative attempt to shame-- played some trombone. Patrick had described Still Flyin' to me as sort of a white reggae band-- a twee-reggae band-- which I have to admit didn't exactly sound like the greatest thing (sorry, Matisyahu). Turns out, yeah, there's a bit of that Jamaican upswing on tracks like "Forever Dudes". More than that, though, it's just gleeful indie-pop party music, the kind of music that actually teaches the indie kids to dance again while us bloggers opine about European dance music and hip-hop from the comfort of our headphones with nary a booty-shake. Sounded sort of like LAKE or early Architecture in Helsinki to these ears, really. Which is good. Couldn't hear a lot of the words-- as a sound guy once told the PCC, "If you're trying to get some kind of life-changing point to come across with your lyrics, it ain't happening"-- but as usual at these kinds of shows, it didn't really matter. It probably helped that three of us each bought a round of shots for the band. I remember Mark and I had one of those great, rambling conversations afterward about Australian music. He likes (and has played with some of!) the same Australian bands that I like: Crayon Fields, Sly Hats, Guy Blackman, the Twerps. He also mentioned a few bands I didn't know and will check out: The Motifs, Milk Teddy, and Sleepy Township. Neither of us cares for the Temper Trap. Thanks to Fong's for the chicken and broccoli slice right before closing time, and my apologies to the empty planter on Fourth St. in front of the Lift or someplace like that, I can't really remember, you know how we do. "and my apologies to the empty planter on Fourth St. in front of the Lift or someplace like that, I can't really remember, you know how we do." haha always with a great ending! boo yeah! Hey Marc, Chuck here. Thanks for doing the Music University thing. I liked that your perspective wasn't so local-specific. Some of us really do like to get out now and again, after all, we still have illusions of eventually mattering outside our little hometown. Sorry I didn't come out to the Mews. The only name familiar on that "includes members of" list for me is Ladybug Transistor, and maybe I'm just old and lazy anyway. It was cool to finally meet you in person, and I totally agree with you about how the best thing to do is have fans and make emotional connections. So many people are still so used to the idea that there's a system and consequently some way to game it, if you just crack the pattern. When it comes down to it, there's no substitute for getting out and sharing experiences with people, especially if those experiences involve you playing your music for them. ARE YOU GONNA BUY OUR RECORD OR WHAT?